Ladie’s Fairway & Greene Performance Shirt. Stylish ladies short sleeve shirt made from moisture wicking performance fabric with stretch. Self fabric collar, 4-button placket and open bottom with side vents. The best Fairway & Greene golf shirt for women. Buy it the Ladie’s Annika Luxury TECH Jersey Shirt at CEOgolfshop.com now. There’s a lot of crummy performance shirts for women on the market. Finally, here’s a performance shirt we can call luxury quality. Thank you Annika! Optionally add your company logo. Contact us for quantity discounts. Comparable quality men’s matching shirts are available. CEOgolfshop specializes in volume orders for active lifestyle apparel and executive gifts. While most companies carry only a few colors, we offer the entire line of each brand, so when a customer falls in love with a brand, they have the most choices. CEOgolfshop is an authorized Summit Golf Brands retailer specializing in corporate sales. New Performance Golf shirts from Zero Restriction. Moisture wicking, short sleeve shirt made with Eco friendly poly and cafe. Cafe is polyester made from recycled coffee grounds. This shirt also features special motion flexibility for your golf swing, just like Zero Restriction outerwear. Introductory discount includes FREE Logo embroidery AND special sale price while supplies last. Navy, Red, Dark Sky, Blue, Flagstone, Black in small to 3XL. This is a great deal as part of an introductory offer for this new item from Zero Restriction. Compare to Nike and Under Armour. Great for your golf team, executive gifts, and tournament goodie bag items. Optional logo embroidery. polo, short sleeve, open sleeves. Easy care, machine washable cold. fabric- 54% polyester, 46% café. Cafe is polyester made from recycled coffee grounds. Sale Price: $43, includes logo embroidery. Call for pricing discounts for orders over 144. You may mix and match colors WITHIN THIS STYLE to achieve the minimum order requirement. 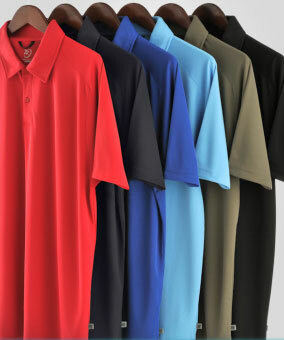 An industry leader in waterproof sportswear, Zero Restriction enters the polo shirt market with a unique fabric to distinguish their brand from others in the performance polo market. What men’s polo shirts does Fairway & Greene offer in 3XL? All golf shirts jackets and pullovers now come in triple extra large. Below are two of our most popular moisture wicking shirts. Featuring the luxurious Fairway & Greene 100% Double Mercerized Pima Cotton on the face, backed with fine micro dernier yarn. Fairway and Greene Pureformance golf shirt is Fairway & Greene’s best moisture wicking polo shirt. Brilliant colors and classic stripes in a hybrid fabric. The unique fabric design includes 100% Double Mercerized lisle cotton in the colored areas of the garment for luxurious hand and drape, while the white background of the garment consists of oxford mesh cotton for moisture wicking protection and breathability. We now have only a 12 piece minimum to add your embroidered logo to all Fairway and Greene shirts. Without logos, 1 unit minimum. Mix and match any styles, sizes and colors as long it is the minimum unit total. For corporate orders, we recommend you create an account in the CEO golf shop online store, enter all your items in the shopping cart, register and select PAY BY CHECK OR PO, then give us a call or send us an email. Once we receive your logo for embroidery, we’ll confirm your pricing and send you a link to pay.